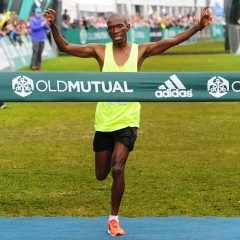 Cape Town - The tiny mountain kingdom of Lesotho produced not one, but two podium places in this year’s Old Mutual Two Oceans Marathon, when Motlokoa Nkhabutlane and Moeketsi Mosuhli clinched first and third place respectively. Nkhabutlane made his break at the top of Southern Cross Drive and took a convincing win in 03:10:27. He was followed by Collen Makaza from Zimbabwe, who finished in a time of 03:12:41, and Mosuhli, who reached the finish line a minute later. The 30 year old winner, who was initially worried about being caught by the chasing bunch after his breakaway, said that the Lesotho team’s strong focus on group training played a major role in his and Mosuhli’s performance. The biggest surprise of the day, however, came in the form of Caroline Wöstmann, who took the top stop in the ladies’ Ultra race – making her the first South African woman to win since 2001. Wöstmann, running in Nedbank colours, finished in a time of 03:41:23 – 70 minutes faster than her 2014 time – with Russian defending champ Nina Podnebesnova in second place (03:44:04) and “dark horse” Tanith Maxwell finishing third (03:45:18) in her debut Ultra. “I felt fantastic and had a great race today,” Wöstmann said, recounting how she inched her way to the front of the pack until she finally passed Podnebesnova in the final 5 kilometres, who had maintained a strong lead until that point. In the Half Marathon men’s race, Stephen Mokoka successfully defended his title in a sprint finish. He crossed the finish line in a time of 01:04:00, 16 seconds faster than in 2014. Boxer Superstores athlete Elroy Gelant came second (01:04:04), with Joel Mmone finishing in third place (01:04:05). The Phalula twins dominated the ladies’ race, with Lebogang crossing the finish line in 01:14:48 and her sister, Diana (defending her 2014 title) finishing in third place (01:15:31). Mapaseka Makhanya came second, in a time of 01:15:08. The early morning dawned to perfect weather as a sold-out field of athletes lined up for their start in Newlands. Conditions soon turned wet and chilly when the rain came down just after 07:00. “We were grateful for the rain, as it made for a pleasantly cool day on the road and helped to settle the ash along the Ultra route,” says Carol Vosloo, general manager of the Two Oceans Marathon NPC. Title Sponsor Old Mutual had originally offered a R1 million prize to the male and female runner to break the Ultra Marathon records. But as Easter Saturday once again draws to a close, the 1988 and 1989 records established by Thompson Magawana (03:03:44) and Frith van der Merwe (03:30:36) respectively, remain in place for another year.